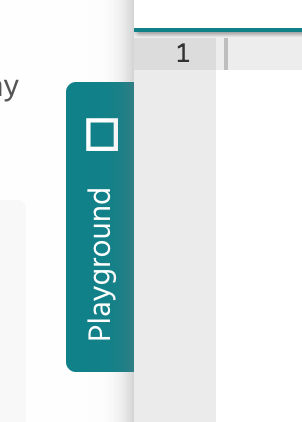 I don't remember the playground ever having a logo. Was there ever one? The favicon is still the old logo though. @ceremcem may be referring to this? Ah, actually - I think it is intentional. Apologies, I thought it was what shows when a special character is unable to display. I'm ok with it, sure. I dare say just a play symbol would be nice and clean, and still distinguishable as a playground tab. But either is fine with me really. Off topic: I had some much-needed downtime when I got in from work, so flicked on the PS4 and fired up the Crash Bandicoot re-release. Ugh. I feel like I need a new project. Is anyone working on anything and for some reason need a total newb to get involved and probably ruin it? Well, I like ideas. And projects help me learn so I'm always open to them. It might seem like I'm backpedaling a little here but I have to stress I'm pretty new to a lot of these concepts. These sound like a level of sorcery I'm probably not capable of at this point. Perhaps I'll stick to helping with the Ractive docs for a while. design is your jam - have you looked at dynamic component css support for theming purposes? Oh cool! I'll take a look! @ceremcem haha. It's true. I'm not ready for reality! @evs-chris actually theming stuff is something I'm really keen on. Most recently I'd been using one of my projects to get my preferred workflow down. It does use Svelte, though. It taught me a lot about the peaks and pitfalls of component styling. do you think adding a "when" section to each API element would be useful? I found myself asking "okay, when should I use delegate? That would be hard to maintain/make consistent for each API (that's sort of what happened to the "example for everything" idea - not everything got an example). A dedicated section in the docs, together with an "FAQ" might be better. With each section split by feature/group of features, not necessarily by function/method/property. i.e. "When to use observers", "When NOT to use observers", "When to use computed data", "When to use helpers", "When to use scripted CSS" etc. This section would be more free-form, more "when, where and why" than the API section which is the "what and how". hm. right, for example adding a "when" section to "ractive.set" has no meaning. FAQ idea is wonderful. so, when should I use delegate? Depends on use case. It's like choosing between a single jquery.on on parent vs jquery.click for each child. @ceremcem It's too expensive to add event listener to each row of a list, so good practice to use event bubbling and add single listener to parent. delegate is true by default, so no extra action is needed. When to set it to false is a tougher question to answer.